Now available – Online access to account information, paperless billing, Pay-By-Phone 24/7, account notifications via email or text message and much more! 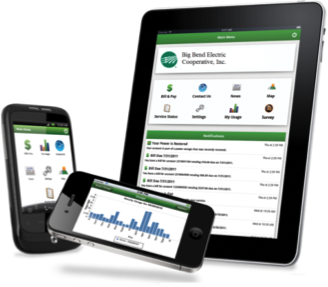 SmartHub is a convenient two-way communication program that allows members to access their Big Bend Electric account information through personal computers and mobile devices, including iPhone, iPad and Android smart phones and tablets. Access SmartHub online by clicking on “Manage Account” or “Pay Your Bill” below. Big Bend Electric is proud to provide you with powerful, secure and convenient account access, as well as detailed information about your energy usage. Sign up today to experience the new and exciting features of SmartHub! If you want to make a payment on your account over the phone using a credit/debit card or check, you must now call the above number. The system is automated and available 24 hours a day/7 days a week. All of your personal information, such as credit card number and payment amount will be entered by you, ensuring a safe and secure transaction. This will allow you to make payments when it is convenient for you. If you have any questions about SmartHub or the Pay-By-Phone system, please contact our office at 1-866-844-2363.